New York City's Pennsylvania Station -- the busiest train stop in America -- is the ultimate symbol of our nation's shameful neglect of rail travel over the past sixty years. As opposed to the impressiveness of historic Grand Central Terminal or the efficiency of modern European and Asian high-speed rail stations, Penn Station is the forgotten stepchild of transportation hubs. Right now Penn Station is a mess. It is cramped, ugly, hot, smelly and forces passengers to huddle around the big arrival and departure board to wait for the gate announcement at literally the last minute before a mad scramble to crush each other while trying to get down the one escalator to the train tracks. It is not the way people should arrive or exit the greatest city in the world. "The project is the world's largest stand-alone integrated photovoltaic -- or BIPV -- project, reports China's state-run news agency Xinhua. Using 20,000 solar panels, the 6.68-megawatt system covers an area of 73,000 square yards. The system, which started transmitting power to the grid in Shanghai Sunday, is capable of producing 6.3 million kilowatts hours of electricity each year, supplying power to 12,000 households in Shanghai. The solar-powered train station has produced 300,000 kilowatts of power since it began operating in early July. It is expected to reduce coal consumption by 2,254 tons and cut carbon emissions by 6,600 tons." But Penn Station hasn't always been such an awful place. 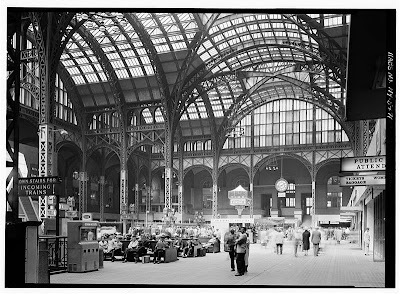 Before the controversial construction of Madison Square Garden that started in 1963 demolished it, the old Penn Station was one of NYC's finest landmarks with its grand Romanesque architecture. It represented America's golden age of rail travel. 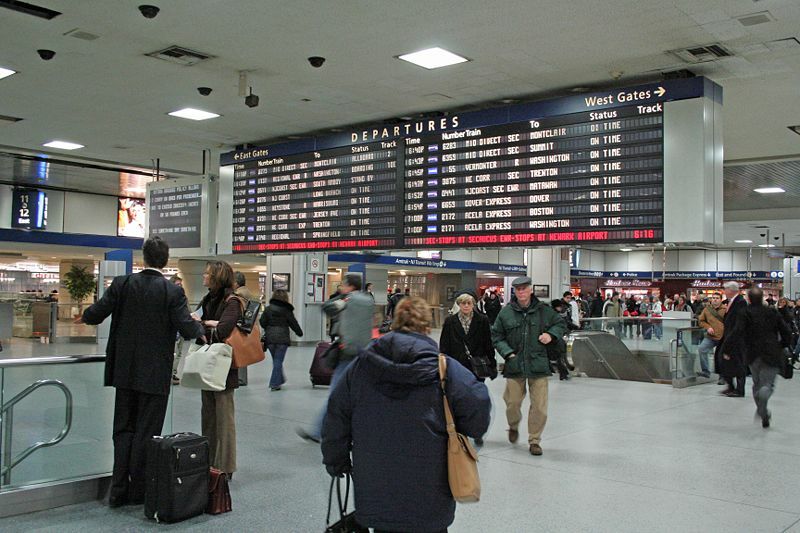 But thankfully there are plans in the works for a new Penn Station and while there have been many delays, it appears that the project is back on track again thanks to an injection of federal stimulus money. The original plans were initiated by the late Senator Daniel Patrick Moynihan. "On February 16, 2010, $83.4 million from the federal government's TIGER program was awarded to the Moynihan Station project, which together with $169 million from other sources allows the first phase of construction to be fully funded. New construction plans include two new entrances from West of Eighth Avenue through the Farley Building, doubled length and width of the West End Concourse, thirteen new "vertical access points" (escalators, elevators and stairs) to the platforms, doubled width of the 33rd Street Connector between Penn and the West End Concourse, and other critical infrastructure improvements including platform ventilation and catenary work. On July 30, 2010, the New York state government approved the plans; as a result, construction is expected to begin in October 2010, with completion of the first phase scheduled for 2016."